I learned about Krav Maga for a long time from several holidays in Israel. 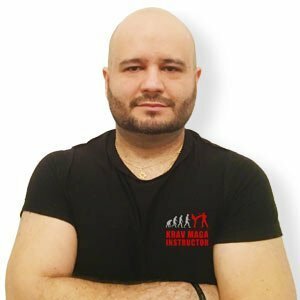 After some trials, 8 years ago, I signed up for the Krav Maga club « Amicale Massilia Krav Maga » managed by Richard Sette, an enthusiaste of this discipline and a real pedagogue who permitted me to share and surpass myself in our common passion. I practiced a lot, at least five trainings per week, in order to achieve my sporting and spiritual goal. For me, Krav Maga is more than a sport; it’s a state of mind which allows to keep self-confidence in any circumstance (body and spirit) to know self-defense without automatically trying to attack. On these points, the words of Imi Litchenfield, Krav Maga founder, are resounding inside me. During these eight years, besides the continuous training with Richard Sette, I have had the chance to follow trainings with the best instructors from France and Israel. Quickly, their teaching gave me the desire to teach in my turn. It was a challenge. I put all my energy and all my passion for Krav Maga. Today, I’m happy to be an instructor and it’s a new experience that starts. An even more rewarding experience and the beginning of a new adventure with the students.